Ok here we go. My first article. 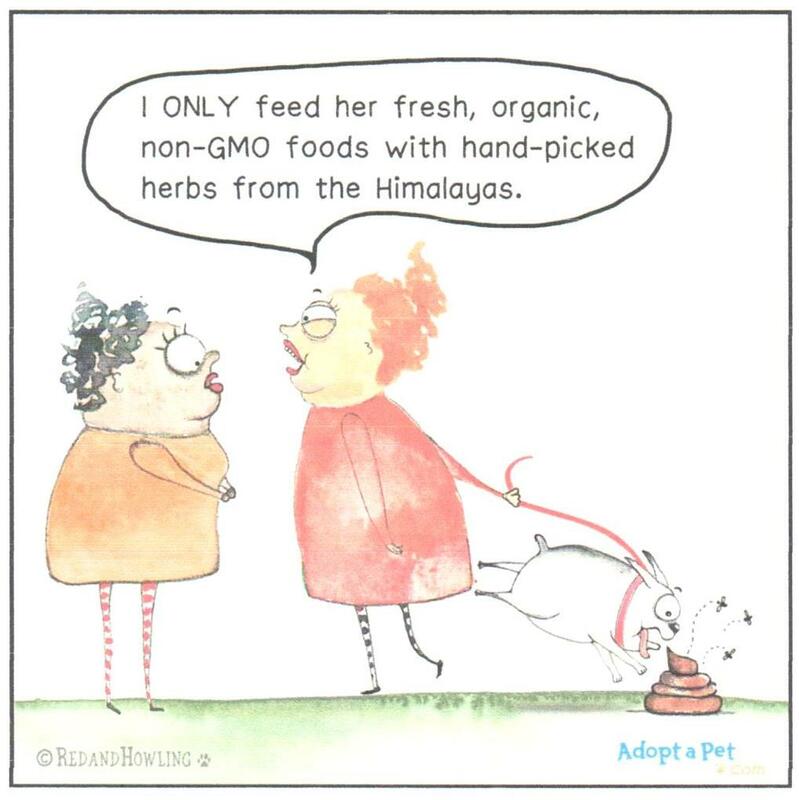 I wanted to start with something that relates to every pet owner and figured feeding is one of the mostly frequently asked questions and is something that people have misinformed knowledge about. I'll try it keep it short and simple. 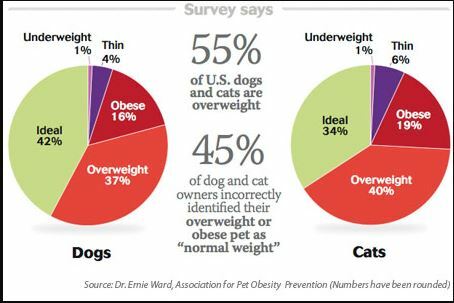 As shown above, more than 50% of dogs and cats in US are overweight. And lots of people don't even realize that their pets are obese. That's a problem, isn't it? First off, let's start with how to decide who's obese and who's not. 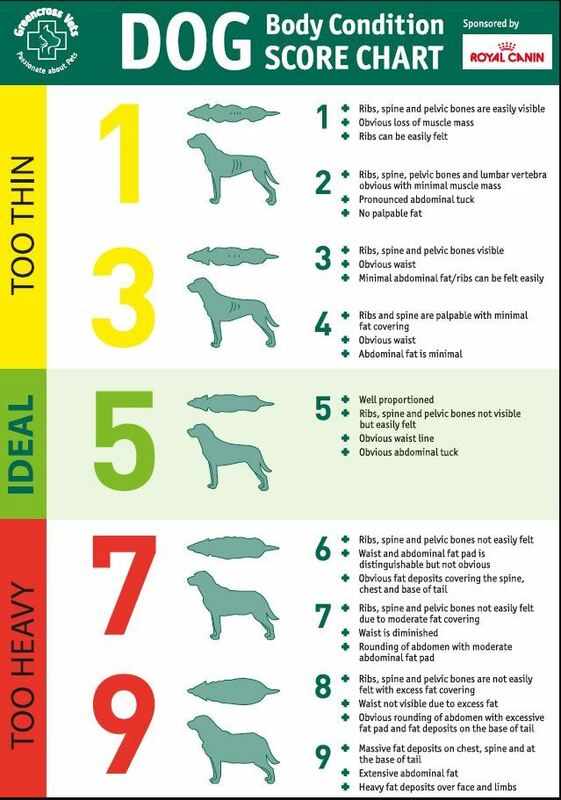 First thing to determine if your pet has ideal body weight (BW) is to see and feel the ribs as the chart above shows you. They should be easily felt when you lay your hands on the chest but should not be visible. Now that you know that your pet is obese or too thin, decide how much of weight you need to shave off of your pet. For instance, your dog is 80 lbs. Ideal weight you think would be 70 lbs. 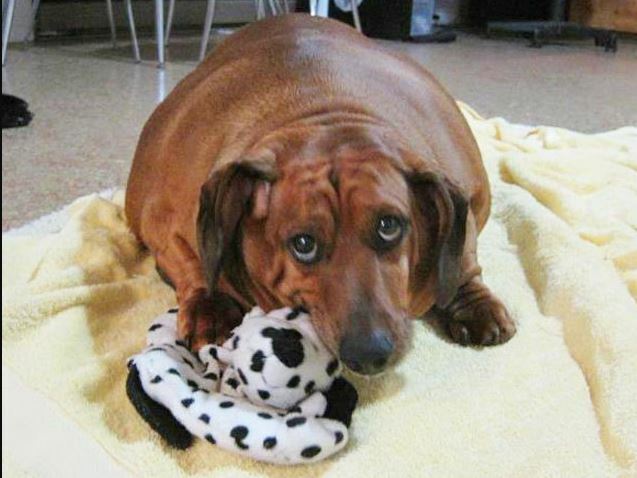 If you have no idea how much your pet has to lose weight, a good starting point is 5% of body weight for 6-7 body condition score (BCS) and 10% for 8-9 BCS. In this case, 10 % is 8 lbs. Hence the goal weight is 72 lbs. 30 X (72/2.2) +70=1,160 Kcal/day. Usual dog food has 340-370 Kcal/cup (8oz). Then 1,160 Kcal would be roughly 3.5 cups. Stick to the amount for a few months and check your pet's weight regularly. Be patient. It won't decrease in 1 day. Now lastly, decide what time of the day you feed your pet with the calculated amount. Generally, you should feed your pet minimum twice a day. So halve the 1,160 Kcal and give the half AM and another half in PM. Most people are busy in AM preparing for the day. Give the food and get on with your day schedule if so. But at least in PM when you return from work, give the food and make sure to provide some form of exercise 1-2 hours after feeding to burn some fat. As we know ourselves, shaving weight is much harder than putting some on. But follow my suggestion and who knows? You might see some light at the end of the tunnel finally. 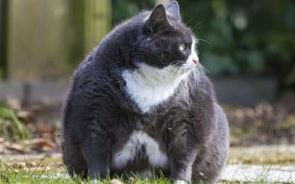 But if this measure fails, then your pet might have a medical condition that makes the pet prone to obesity such as hypothyroid. One size doesn't fit all. So always have your vet check your pet's general condition first before you start following my direction. Chao.